This fine home was originally built in 1950 and was owned by the same family up until we purchased it in 2003. We have rebuilt this home, keeping the best of the old while combining it with the best of the new. The result is a home that is fully up to today's standards and the expectations of discriminating home buyers, while retaining the workmanship and character of yesteryear. This home is absolutely rock solid and ready for any hurricane that might come this far inland. 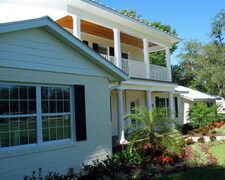 It was built with higher quality materials and workmanship than you will find in new construction today. Anything that we changed or added was done with higher quality, lower maintenance materials than on the vast majority of new construction. In addition, we have done a number of things to make it a very energy efficient home. The net result is a highly desirable home that will look great long into the future. This home is perfect for raising a family (or to have the grandkids over to). There's plenty of room inside the house. Outside, with a pool and a lake for water activities, a dock to hang out at, plenty of trees for climbing or staying cool under, and lots of yard to run around in, it is the perfect environment. And should you decide to "get away", everything is nearby.